We live in a changing world. We live in the era of the ‘Information Revolution’. For the first time in history billions of people around the globe have access to tons of information digitally stored in what we already call “the cloud”. One could reasonably expect unprecedented growth and prosperity for the global economy! So, what about the global financial crisis? What about recession and poverty in the most developed economies of the planet, the US and the EU? What went wrong? A good explanation can be found at the amazing book “The Fifth Discipline: The Art and Practice of the Learning Organization” by MIT’s Peter M. Senge where the Greek word “Metanoia” is introduced to describe the “shift of mind” happening when a piece of information becomes to knowledge. What Senge describes is something that most of us have actually experienced – we know that a ‘bad habit’ may harm us; however having this information does not stop us from doing it. The “shift of mind” has not yet happened – the information has not yet become “knowledge” – and often we don’t quit the bad habit before it has harmed us. Over-borrowing in the developed nations in the first decade of the 21st Century represents an amazing example of how bad it can get when you have the information but you don’t have the knowledge. What about businesses and learning technology? We at eFrontLearning aim to provide solutions that help turn information to knowledge – not only at the individual level but also at the workgroup level, which is even more ambitious. 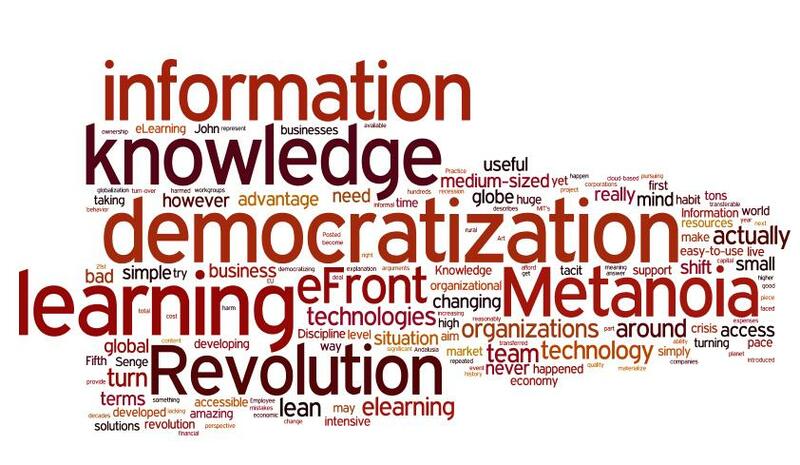 Since the very beginning (2003) we have been pursuing Tacit Knowledge in small- and medium-sized organizations. We try to make this informal knowledge searchable and transferable. We try to actually turn meta-information (that it “John is the person who knows how to deal with this situation“) to really useful information (that is “when this event happened in the past, John successfully faced it in that specific way“). It may sound simple, however it actually is a revolution in terms of organizational management and efficiency! For a very simple reason – small- and medium-sized organizations do not have the resources necessary to turn this tacit knowledge to Explicit Knowledge. They simply do not have the time and budget to do so. They need a lean, real-time approach to grab tacit knowledge and make it accessible to the team. This way organizations are able avoid having the same mistakes repeated over and over again. Why does this happen? Because the information was there but it was never transferred into “knowledge”, it never changed the team’s behavior. With modern, personalized, lean learning technologies for workgroups this can be achieved! But what does this have to do with the democratization of learning? The answer is very simple and obvious – learning technologies have been around for almost two decades, however it has been a luxury product, both in terms of capital expenditure and in terms of operational expenses. The total cost of ownership for a complete, state-of-the-art eLearning solution has been so high that only large corporations could afford it. Because of this situation, hundreds of thousands of companies around the globe have been excluded from the ability to turn information readily available on the Web into really useful knowledge. Because of this situation, the vast majority of businesses cannot really take advantage of the ‘Information Revolution’. This is where eFront comes in and disrupts the market – making a huge step towards the democratization of learning technologies, and so the actual democratization of learning. 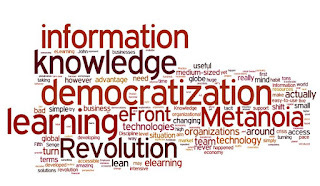 - So, what is the eFront vision for democratizing learning? The eFront team envisions every single business having the right to access quality, affordable, easy-to-use, lean learning technology tools that offer support in taking advantage of the information revolution and actually increasing its organizational knowledge both from a qualitative and quantitative perspective. We aim to materialize all of this in developing value-for-money, cloud-based, mobile-enabled technology solutions targeting the huge market of small- and medium-sized organizations around the globe. No matter if your business is based in a global metropolis like NYC, London, Sydney, Ontario, or Moscow, or a rural village in Montana, Andalusia or Toscana, you can very simply access a technology platform from your browser, tablet or smartphone and experience “metanoia”, shift of mind for you and your team while taking advantage of the tons of information out there, turning that information into useful knowledge for sustaining and developing your business!